Hello! 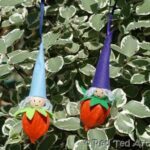 Welcome back to this week’s How To… and this week we have even MORE Christmas Elves. I just couldn’t resist. 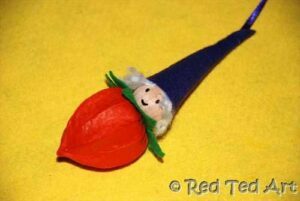 The basic elf is the same as the ones I showed you a couple of weeks ago, but your materials are slightly different. 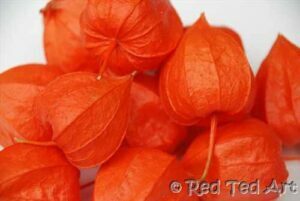 This time instead of gumnuts and pine cones I used the “Japanes Lantern” fruit from the Physalis plant. It is a beauftiful beautiful orange and really reminds me of Autumn. Physalis are a typical Autumn plant and I have seen them in a number of front gardens (I believe they may even be a weed!). They are delicate and yet strangely sturdy. 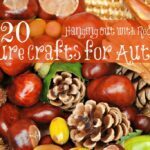 And make a wonderful Autumn or Christmas craft material. 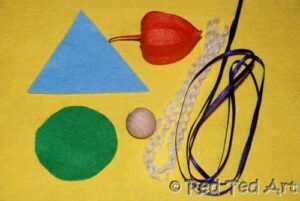 Materials: Felt, a little wool (unravelled), wooden bead, “lampionblume” (Physalis plant), ribbon, paint & brush, hot glue gun or wood glue. 1) Cut out your felt pieces. 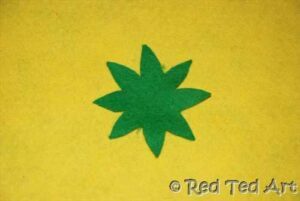 For the long pointy hat, you need a long triangle. The two long sides of mine are approx 7cm long. For the green collar, I cut a circle. Then made 8 cuts into and cut out 8 point “leaves”. 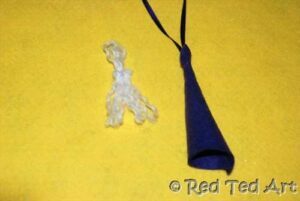 2) Unravelled you wool and take about 8 strands. 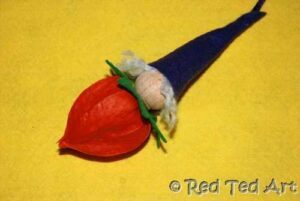 With the hot glue gun, glue your hat and ribbon together and then add your “hair”. Before I glued the hair in place, I check against the wooden bead how it would look the nicests. 3) Assemble all your pieces and glue them in place with the hot glue gun – i.e. wooden bead to hair and hat, green collar to wooden bead, physalis to green collar. 4) Paint your face. I used acrylics, as they do not run into the grain of the wood. 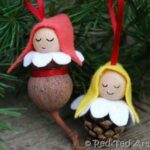 These little Christmas Elves sure will stand out on the Christmas Tree! Oh they look gorgeous! Definitely one for our Christmas to-do list. I can see this being a very busy festive season! Now where will I find physalis?! 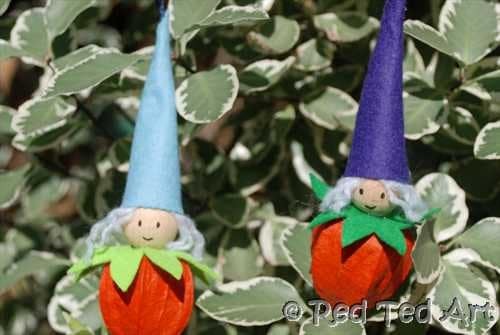 Ah yes.. the Physalis… you can make them with pine cones though, am sure they would look lovely too!!! Ahhhhh Those are so cute. 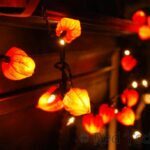 I used to grow Japanese lanterns in my yard. I might have to get some more plants in the spring. Oooh what a bonus to grow them yourself! These are lovely! 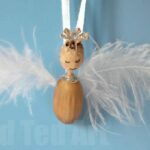 I’m going to try and make some with my little boy, they’ll sit perfectly on the Christmas Tree. 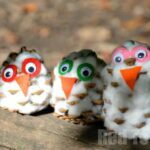 Made by Ewe – oh yes, I love the contrast to autumn days! Muminator – hooray! Have fun! Aaaah thank you Chris. I was rather pleased with them too…. 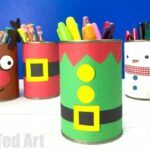 What an fantastic blog,These would be great to make with the children something that would get them all involved.Keep up the good work. Those are ridiculously cute! Thank you for a wonderful tutorial. Thank you for sharing at Crafty Moms Share Sharing Saturday!! These are adorable!! Now there is an idea Becky!!! Eek! These are so cute. Hey, btw, I didn’t realize your tweets were telling me your comments were in my spam folder on the blog – thought the tweets were spam 🙂 Taken care of it! 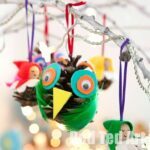 Only yesterday I finished making advent calendar for my daughter and found this article in search for some more ideas. 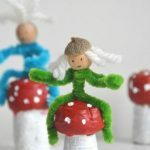 These are adorable, thanks for linking up at Beyond the Picket Fence.